Western Pennsylvania has long been a hub for innovation. 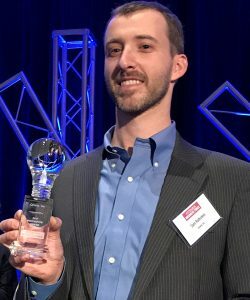 This year the Pittsburgh Business Times (PBT) introduced its Innovation Awards, a program that recognizes those that made extraordinary advances in their respective fields, challenging conventional thinking. They are the disruptors, creating new products and developing new approaches that challenge traditional approaches. 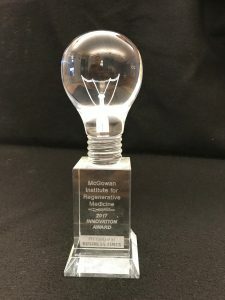 The McGowan Institute for Regenerative Medicine was selected as one of the winners of this inaugural award for its pioneering development and clinical implementation of regenerative medicine-based therapies. 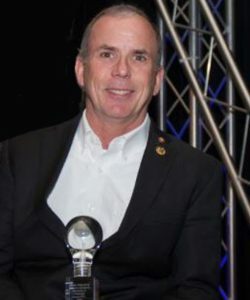 Also, the Human Engineering Research Laboratory under the leadership of McGowan Institute affiliated faculty member Rory Cooper, PhD, was recognized for the development of the PneuChair (TM) pneumatic wheelchair as a PBT Innovation Award winner. The third awardee that has a McGowan Institute relationship is Qrono, Inc. This Pittsburgh start-up was formed by McGowan Institute faculty member Steven Little, PhD, and his former graduate student Sam Rothstein, PhD. Regenerative medicine seeks to reestablish tissue and organ function impaired by disease, trauma, or congenital abnormalities. To achieve these outcomes, the primary tools used are tissue engineering, cell-based therapy, and medical devices and artificial organs. The McGowan Institute has advanced the state-of-the-art in these areas. The McGowan Institute’s tag line is “Regeneration Through Innovation” (TM), and based on the advances realized the McGowan Institute affiliated faculty have demonstrated that the spirit of innovation is alive at the Institute. 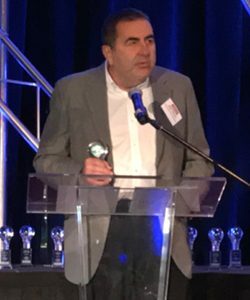 Accepting the award on behalf of the McGowan Institute was William Federspiel, PhD, William Kepler Whiteford Professor, Department of Bioengineering, and the Director of the Medical Devices Laboratory at the McGowan Institute. The traditional standard of care primarily is focused on treating the symptoms of an insult to the body, whereas regenerative medicine seeks to reestablish tissue and organ function. The research conducted by McGowan Institute faculty benefits people who have a medical impairment, and secondarily, in many cases these technologies reduce the life-cycle costs to treat a chronic medical condition. HERL was recognized by the PBT for the development of the PneuChair (TM) pneumatic wheelchair, which uses high-pressure air as an energy source instead of heavy batteries and electronics. The pneumatically powered chair also has the advantage that it is not affected by wet environments (like a splash park), and can be recharged in minutes vs. hours for a battery-powered chair. HERL is a joint effort between Pitt, the U.S. Department of Veterans Affairs, and UPMC. Accepting the award was Rory Cooper, PhD, Founding Director and VA Senior Research Career Scientist of HERL. Dr. Cooper is a McGowan Institute affiliated faculty member and the FISA & Paralyzed Veterans of America (PVA) Chair and Distinguished Professor of the Department of Rehabilitation Science & Technology, and professor of Bioengineering, Physical Medicine and Rehabilitation, and Orthopedic Surgery at the University of Pittsburgh. This Pittsburgh start-up was formed by McGowan Institute faculty member Steven Little, PhD, Chairman of the Department of Chemical and Petroleum Engineering and the William Kepler Whiteford Endowed Professor in the Departments of Chemical and Petroleum Engineering, Bioengineering, Immunology, and Ophthalmology, and his former graduate student Sam Rothstein, PhD. Qrono, Inc. custom designs controlled release formulations in silico for pharmaceutical companies, academic laboratories, and agricultural companies. Leading cancer therapies and most still under development target specific tumor receptor profiles or signaling pathways. Clinical data suggests that patients benefit most from these therapies when their tumors match particular molecular patterns. Qrono is bypassing molecular limitations with a new approach: targeting tumor and support cells through their innate behaviors. Qrono is targeting innate cell behaviors instead of niche signals and receptors. Accepting the award was Dr. Rothstein, CEO of Qrono.